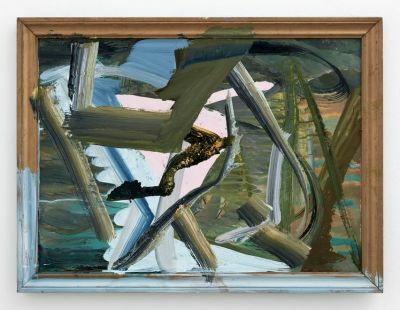 Sperone Westwater is pleased to present "I want to live in the afternoon of that day," its first solo exhibition of new paintings by Katy Moran and her first in New York since 2015. Color has assumed a newly significant role in Moran’s work over the last two years following a period of exploration of desaturated white monochromes. In much of her latest body of work, the earthy palette, occasionally punctuated by vibrant corals and blues, is layered while the brushwork has become looser and more gestural. The physicality of her paint handling is enhanced by her use of found frames (in some cases turned on their side). For Moran, incorporating these existing objects and the various painting techniques employed characterize her process and contribute to the dynamic surfaces she creates. Katy Moran lives and works in London. She was born in Manchester in 1975 and completed an MA in painting at the Royal College of Art, London in 2005. Moran’s work has been the subject of solo exhibitions at Parasol Unit for Contemporary Art, London (2015); the Douglas Hyde Gallery, Dublin (2013); Wexner Center for the Arts (2010); Tate St. Ives (2009); and Middlesbrough Institute of Modern Art, U.K. (2008). Her work has been featured in group exhibitions at Aspen Art Museum (2015); Walker Art Center (2013); SFMOMA (2012); and Tate Britain (2008). Among the public and private collections that include her work are Tate; SFMOMA; Walker Art Center; Arts Council Collection, U.K.; Royal College of Art; Agnes Gund; Elton John & David Furnish; David Roberts Art Foundation; The Rachofsky Collection; and Zabludowicz Collection.